but we understand that questions are worth answering. We hope this overview will provide a start. Everything Lutherans believe comes from the Bible, God’s message of love and hope for everyone. The Bible is the written word of God, handed down to us in order to point us to the truth that we are saved from our sin and eternal death by the life, death, and resurrection of Jesus Christ. It is in the Bible that we learn everything we need to know about God’s love and gifts to us. We believe Jesus is God’s own son, sent by God to become human. As the son of God, Jesus is divine, but he was also a human being who lived among us on earth, over 2,000 years ago. Followers of Jesus are part of God’s people, whose heritage includes the Jewish people and the Christian Church throughout the world today. As a person, Jesus of Nazareth, was a Jew who lived and died in biblical Israel under Roman rule in a province the Romans called Palestine. He spent his adult life in ministry with his disciples, traveling around the region, teaching about God and spreading a message of God’s love, peace, hope and forgiveness. He healed the sick and fed the hungry. He gathered many followers who were passionate about his teachings. As his following grew, some of the religious leaders became more and more distrustful and angry with him, until he was eventually turned over to the Roman government by Judas, one of his own disciples. The Roman governor Pontius Pilate then sentenced him to execution. He died by being nailed to a cross in the outskirts of the city of Jerusalem. and end up separating us from God. he bears our sin and gives us his forgiveness. that whoever believes in him shall not perish but have eternal life” (John 3:16). There is absolutely nothing we can do to “be saved” — Jesus Christ has already done everything necessary. In his death and resurrection, everyone who believes in Jesus as Savior has been brought back into a right relationship with God and everyone who believes is “justified,” or declared innocent by God. It is through faith in Jesus that we receive the forgiveness of sins and eternal life — by believing that he has freed us from the guilt, punishment and power of sin. Faith is a gift worked in us by the power of the Holy Spirit; it doesn’t come to us through anything we are capable of, but through what God does for us. We simply receive what is already being offered out of God’s great love. 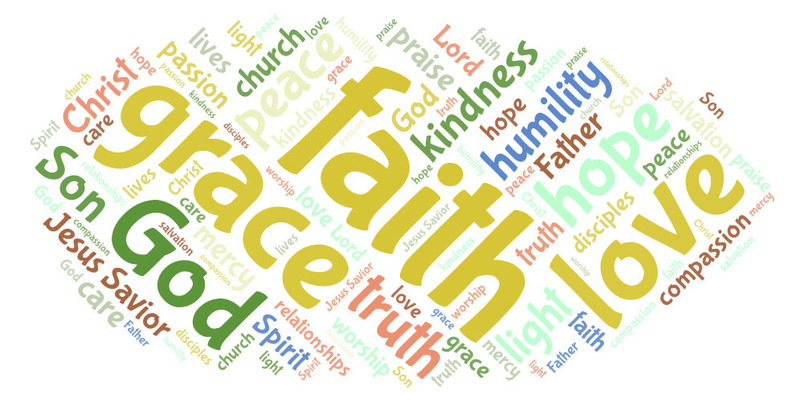 Lutherans often refer to grace. The word itself might remind you of the grace period you are given when paying bills — when your debt can be paid without further penalty. God’s grace is even more wonderful; that’s why it’s called “amazing grace.” While we deserved to pay the penalty for our sins, God had a different plan. Christ paid the debt and we receive forgiveness and eternal life from him that is offered out of unconditional love. That’s why it’s called grace because it is truly undeserved. the Lord’s Supper is our closest communion with Christ as we receive his body and blood. and all those who believe in Jesus as Savior will have eternal life in heaven. Our faith tradition is based on a life-transforming story, a story both ancient and timely about a powerful and patient God who has boundless love for all people of the world, who brings justice for the oppressed. It’s a story of Jesus Christ, changing lives. It’s a story that brings comfort and strength to people who today live in modern, often unsettling times. Learn more about our beliefs — and become a part of our story.